The MCCC Fitness Center offers the community numerous ways to get in shape and stay in shape. 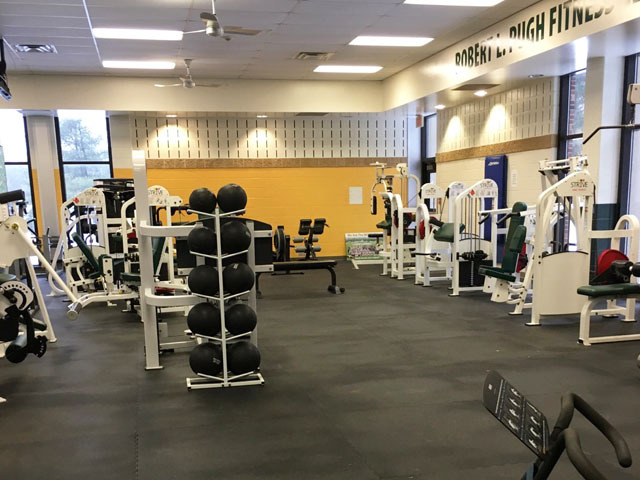 The center includes a fully-equipped fitness facility and an Olympic size swimming pool, located in the Physical Education (PE) Building on MCCC's West Windsor campus. Tennis courts are located adjacent to the PE Building. Members may also participate in weekly exercise classes. Rates are more reasonable than at most area gyms and there are numerous membership options. Fitness Center members work out in a friendly, non-competitive environment. With assistance from a courteous and dedicated staff, they can create and carry out a personal health and fitness program to achieve their long-term goals. Membership is open to all area residents 15 years and older. Those who sign up for an annual membership also have use of the college's Olympic size swimming pool. 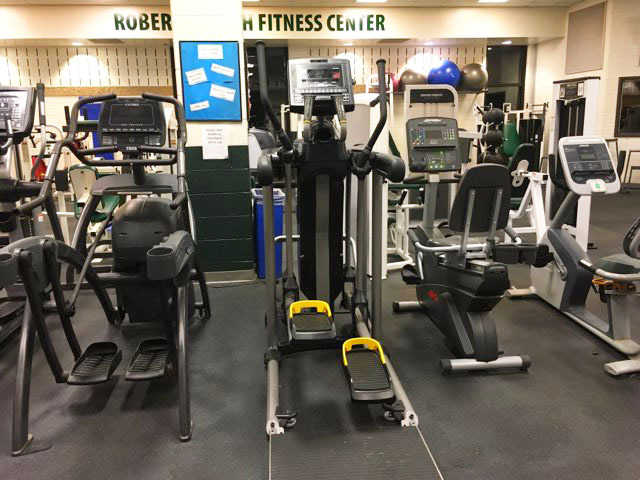 The Fitness Center offers 19 pieces of cardio equipment including an Arc Trainer, Run Free Elliptical, Stairmaster, Upper Body Exerciser, ellipticals, a rowing machine, stationary bicycles, and treadmills. The Fitness Center has 30 machine weights targeting upper and lower body and core. There is also a free weight area which includes benches, dumbbells, kettlebells, medicine balls, and Olympic racks. 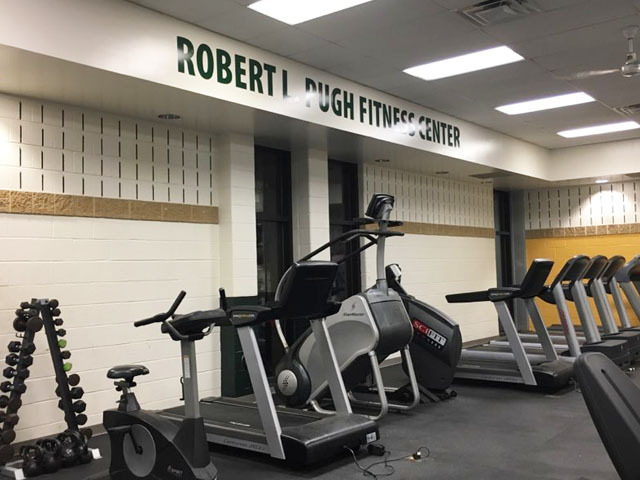 Members are issued a card that must be presented to enter the Fitness Center and for use of the locker rooms, which are open during Fitness Center hours. Annual Restricted Mon. - Fri.
* Annual membership includes use of the pool during recreational hours. + Senior citizens are persons 65 and older. Call 609-570-3738 for General Office or 609-570-3741 for Coordinator Erin Cahill. Or, stop by the Fitness Center during operating hours to sign up for a membership. Mon., Wed. 6 a.m. to 9 p.m.
Tues., Thurs. 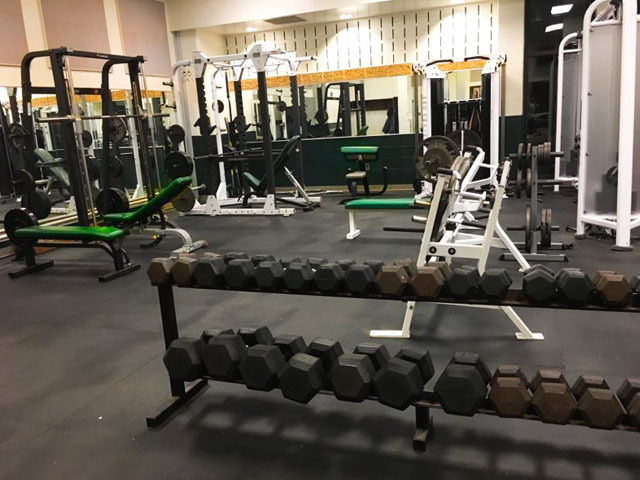 7 a.m. to 9 p.m.
New Fitness Center members may arrange for an orientation about workout equipment. Staff will also provide a written workout plan based on members' goals. Members must sign in and show their ID card at every visit. Food and beverages are prohibited in workout and pool areas (except for water). Spotters are required for heavy lifting in the Fitness Center. Appropriate attire is required. Athletic shoes should be worn in the Fitness Center. Swimmers are asked to wear swimsuits, not cut-off jeans or shorts. Children in diapers must wear plastic pants with snug elastic bands at waist and leg. For further information e-mail fitness@mccc.edu or call (609) 586-3738 or 3741. 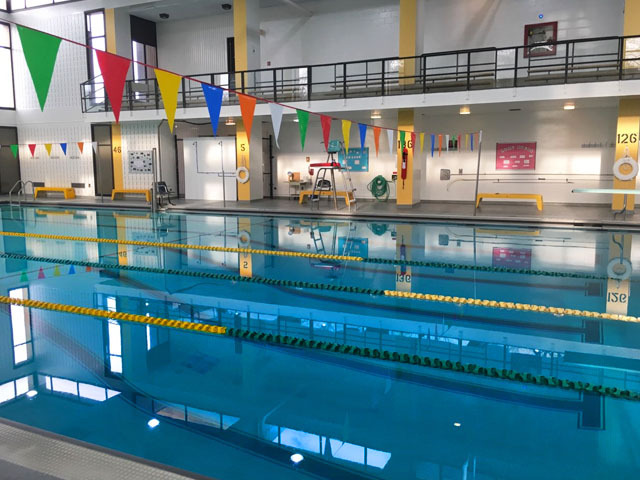 The general public along with Mercer County Community College students, faculty and staff are welcome to use MCCC's 25-yard heated swimming pool. 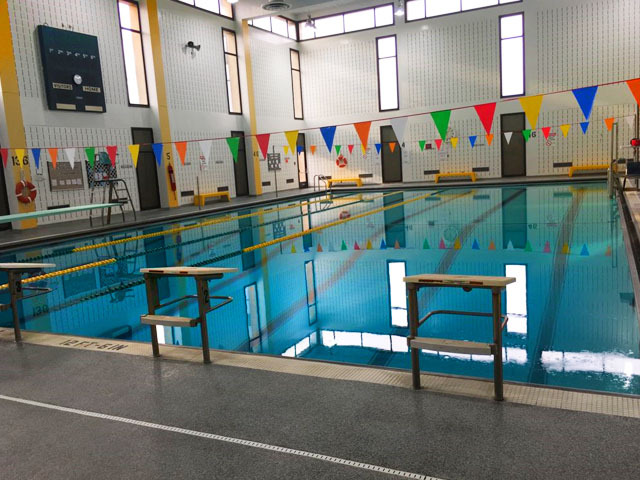 Recreational swim members may take part in the college's exercise classes and recreational basketball and volleyball games. These activities are listed on the college calendar. Members are issued a card that must be presented for entrance to the pool area and for use of the locker rooms. * "Family" maximum of 5 people. 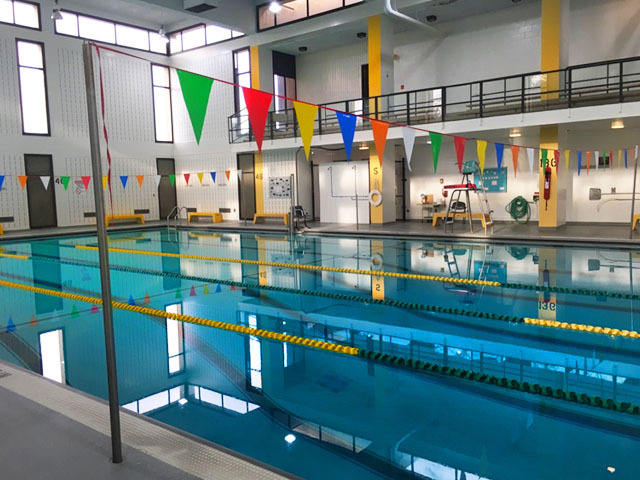 Pool/Recreation passes are purchased in the Fitness Center located in the PE Building on the West Windsor Campus, (609) 570-3738 or 3741. Recreational memberships do not include use of the Fitness Center. Mon., Wed., Fri. 6:55 - 7:55 a.m. Mon., Tues., Wed., Thurs., Fri. 11 a.m. - 12:45 p.m.
Thursday 7 - 9:55 p.m. 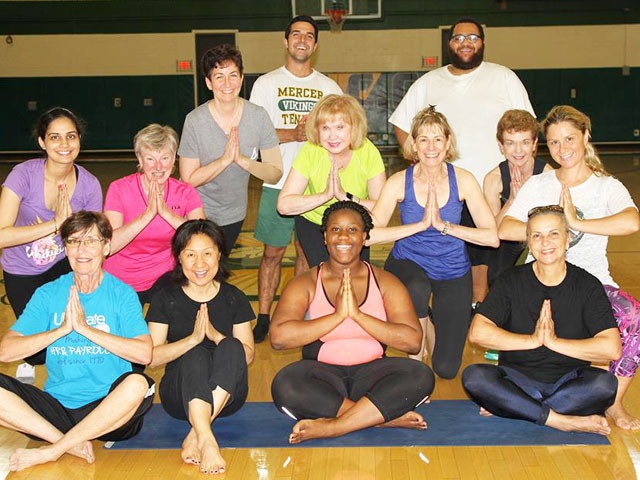 Mon., Tues., Wed. 5:30 - 7 p.m.
Thursday 5:30 - 9:55 p.m.
All Fitness Center and Recreational Swim members may take part in the college's exercise classes, including yoga and zumba, and recreational basketball and volleyball games. The schedule for these activities is listed on the college calendar. Members may also use the college's seven outdoor tennis courts located adjacent to the Physical Education (PE) Building. There are no restrictions on use of the courts. They are available on a first come, first served basis. Questions are welcome. Please e-mail fitness@mccc.edu or call the Department of Athletics, Fitness and Recreation at (609) 570-3738 or 3741.